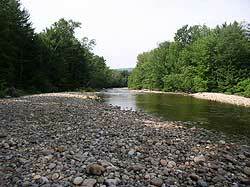 The Baker River watershed lies in the heart of New Hampshire, and covers 136,581 acres or 214 square miles. It begins along the eastern slopes of Mt. Moosilauke in the White Mountain National Forest and travels 36.5 miles through the towns of Warren, Wentworth, Rumney, and Plymouth where it joins the Pemigewasset River. Starting as a steep mountain stream, the Baker gradually flattens, eventually meandering across a broad flood plain through Rumney and Plymouth. 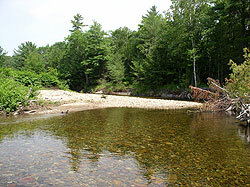 The Baker River is a 4th order river at its junction with Black Brook south of Warren village and becomes a 5th order river when the South Branch joins the Baker River. Though there are no dams on the main stem of the Baker River, there are numerous impoundments, tributaries, wetlands, and ponds (including fire ponds) located through the Baker River watershed. 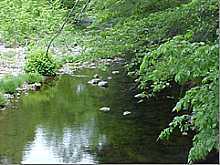 The watershed contains a variety of resources that are important to the region. Over 90% of the Baker River watershed is forested, with a large diversity of vegetation species, and logging and timber provide a viable part of the local economy. Based on USDA soil inventory information, the Baker River watershed contains approximately 2100 acres of prime, unique farmland that is of national importance, 900 acres of state importance, and 8700 acres of local importance. A few dairy farms, produce truck farms, nurseries, and tree farms exist today along with an array of small farms raising beef cattle, poultry, and goats. The Baker River and surrounding watershed support a diverse habitat for a wide variety of wildlife species. The river provides a habitat for coldwater fisheries, including trout and salmon. Fish are important to the Baker River watershed since sport fishing attracts many residents and visitors to the area, and is a large contributor to the economy. The Baker River watershed's general hilly topography provides residents and tourists with unique scenic resources. Scenic vistas abound throughout the Baker River corridor, both from the river itself and from the roads and trails along the river valley and watershed. The wide flood plains and adjoining slopes contain millions of yards of glacially deposited sands and gravels in the Baker River watershed, particularly in the towns of Wentworth, Rumney, and Plymouth. There are several active gravel pits where excavation of sand and gravel provide materials and aggregates for development and construction. Water quality has improved in the Baker River since its low point in degradation during the 1950's when raw sewerage, chicken waste products and feces, sawdust and bark, and chemicals from plants such as the creamery, entered the river on a daily basis. Today, the Baker is classified as a class B river: swimmable, fishable, and potentially acceptable as a drinking water source after full treatment.